Yep. 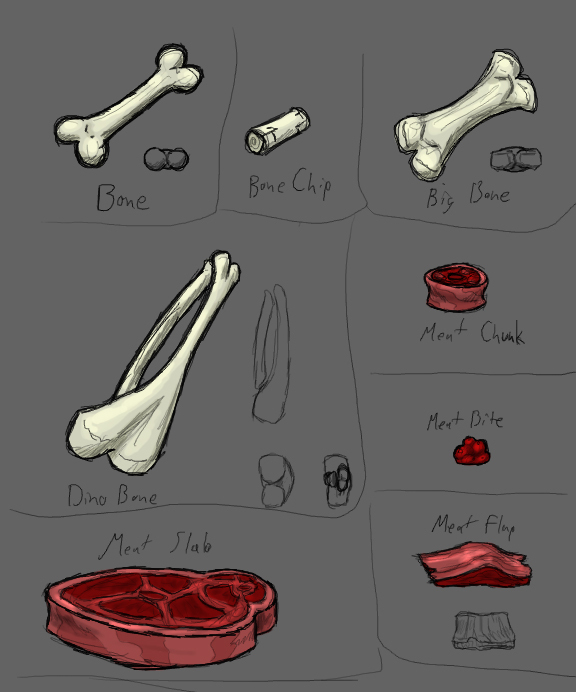 So I worked on concepts for the collectable items, like bones, roots, precious stones, etc. Here they are. 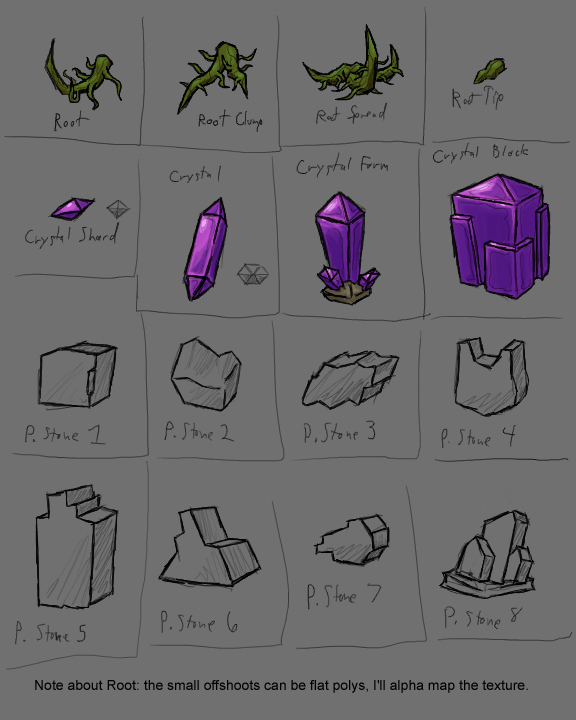 The precious stone meshes will be reused with different maps to reflect the material and worth. Same goes with the nugget, chunk, ore, and slab. Those will be shared for the different metals. Also, happy memorial day! Thanks to all you troops out there, dead and alive, for your years of service to the country and it's citizenry. Stay safe folks. 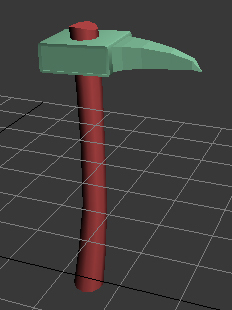 Random drop tables, shipment of pickaxes. Yep, been working on random drop tables today. everything from precious stones to metal, power-ups and tools. Not much to say about it yet. All is not lost for blog however. Art dropped off a shipment of fresh pickaxe meshes today, thanks much dooood! Here's some pics. In order, Fang, Old, Fine, Throwing. I think I'm going to institute a rule on myself called "Texture Teusdays". I work on nothing but textures on Teusday, pretty self explanatory. I've got Bad Eye and these axes to pretty up, don't want to get too buried. 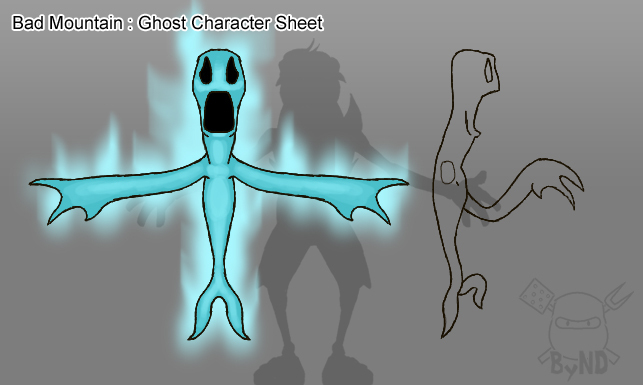 Scripting items, a ghost also. Got most of those food items scripted in game, I think two of them don't do what they're supposed to yet, no problem, just some number juggling. This leaves me no real visuals to present, so here's a ghost. They mostly come out when a dead body is disturbed, their only real attack is haunting you, where they take up residence in your body. Having to much of this going on can yield different results, from simple frights to mild possession. No Bullcrap vid this time, not really enough moving stuff to show off, I don't think anyone wants to see a buffalo burger spin in circles for a minute or so. 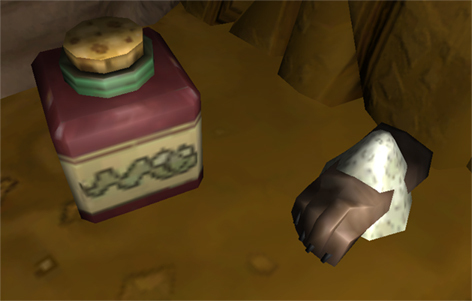 Anyhow, a few more food items, a bottle of Snake Oil, and a Sugared Rabbit Foot. PIC! Ok, so these food items are power-up items, so let me tell you what they'll do for good ol' Beardy. These all have a minute long duration. Testing may change some of this of course. Buffalo Burger - Raises attack power, movement speed is unaffected by large items. Chicken Feet - Increases movement speed and you are immune to slow effects. Turtle Jerky - Stamina is increased, immune to pain, cannot be knocked out, cannot be dazed. Sugared Rabbit Foot - Increases luck, zero cave-ins. Snake Oil - Faster stamina regeneration, cures poison and cold. I managed to get some of the item pick-up code into place, the item spins, you walk into it and it destroys itself. This all prompted me to get the player stat variables in order to begin passing these effects onto the player. Alright, have a good weekend. 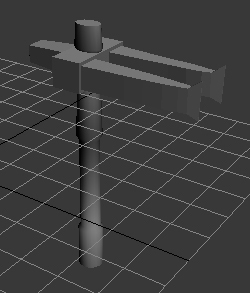 Been modeling some of the powerups for BM. Pictured below, from left to right, Buffalo Burger, Chicken Feet, and Turtle Jerky. Oh, that's the Crush Axe I mentioned some posts back, never had a pic of it, so there you go. I'm wanting to get a few more items done and start coding the drop tables and actual items/effects themselves. I'll be dipping my foot into the advertising pool here in a day or so. So today I've been making ads of various sizes. They all follow a common "Eat, Destroy, Be Sharky" content that my first ad had. I'll be doing this through Project Wonderful, after looking into various ad services, I like their take on it. A bidding system, you set your bid, the amount you're willing to pay per day, and limit the total and/or set a max bid. You get to choose what sites your ad shows up on, they give you the trending visitors per day, it's all very loose and free feeling. Me likey. Anyhow, I've got a few more ads to hammer out. Here's the ones I've got done so far. They aren't nearly as animated as my original, but I have a 100k limit to work with. The next few banners will most likely be still images, or maybe two frames, I'll see how much memory I have to work with. No, I'm not at the beach. I finished up the Sand Wall block, it is fully functional. When you destroy them, they destroy other sand wall blocks that neighbor them in a chain reaction. 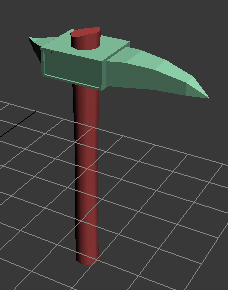 I did the Crush Axe texture today, no pic, silly 3DS renders it wonky. 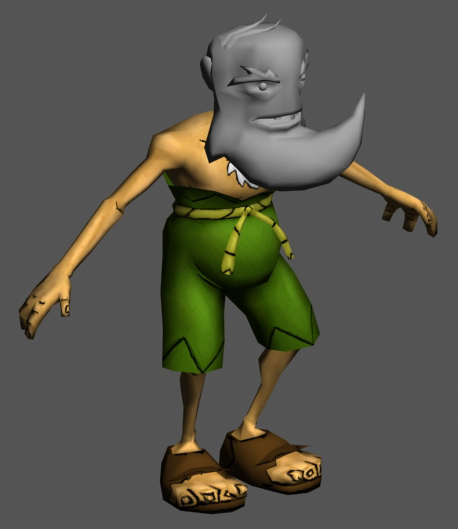 Also started texturing Beardy. 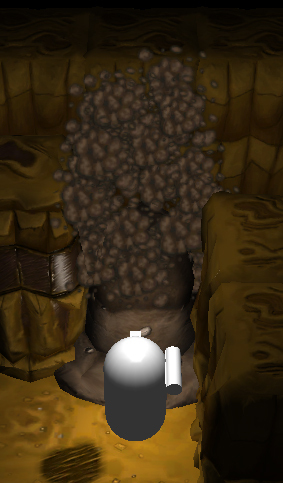 Got particles working for the dirt wall block, looks good too. In motion anyway. There are two that fire off, one for the debree and another for kicking up a dust cloud. Until Friday, here's a pic. 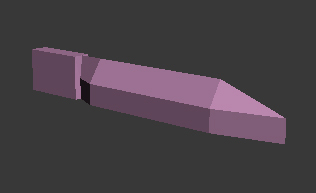 Currently working on the sand wall block, got the model done, just need to texture and get it in game. 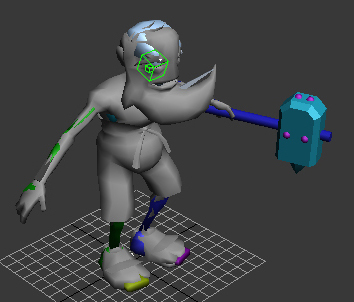 After that I think I'll texture up Beardy(whom is all rigged up thanks to Jay) and that Crushaxe(thanks to Art) which is pictured below. YES! 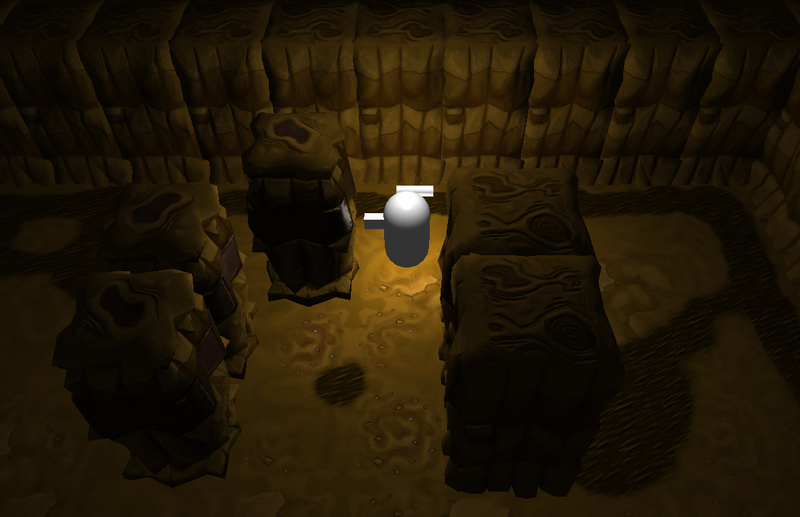 Forget that tile crap, Unity has terrain. 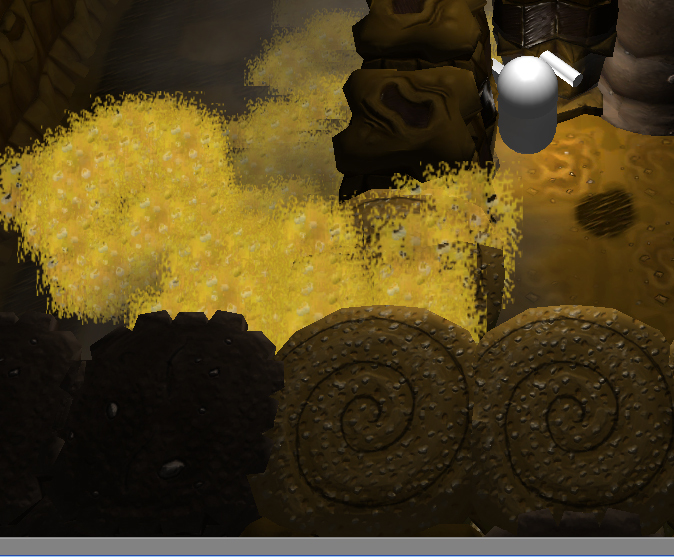 You paint your textures onto it, well, some kind of alpha layers allow multiple textures to show through, I think. Anyway, it's pretty awesome, a ton of freedom for little texture memory cost. A picture perhaps? Yep. Terrain does more as well, geometry like trees or rocks, grass, very cool. I've taken a few days to give The Great White Destroyer a little love, so not much has been done on Bad Mountain. 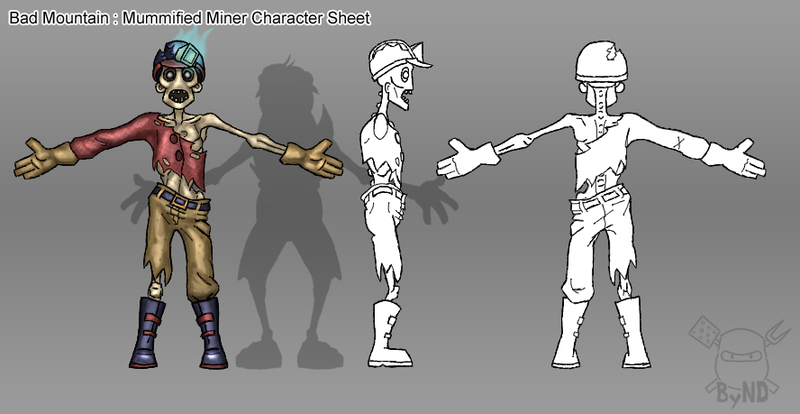 That's why I try to have crap put back, so it's Mummified Miner time, DUR dur DUUURRRR! As for shark, I added a few more edibles in the Eat This section of the website, and other things I won't mention until later. Long day. Here's the video. Now here's a sharky promo.